Lee Rifle Charging Die (#90194). This setup allows you to expand the case mouth AND drop your precise powder measurement through the expanding die without changing dies! The LEE Perfect Powder measure is one of the best kept secrets in reloading. It does a great job of dropping consistent charges with most all powders for around $25. All of our Perfect Adapters® are custom manufactured from top quality 6061 aluminum stock. 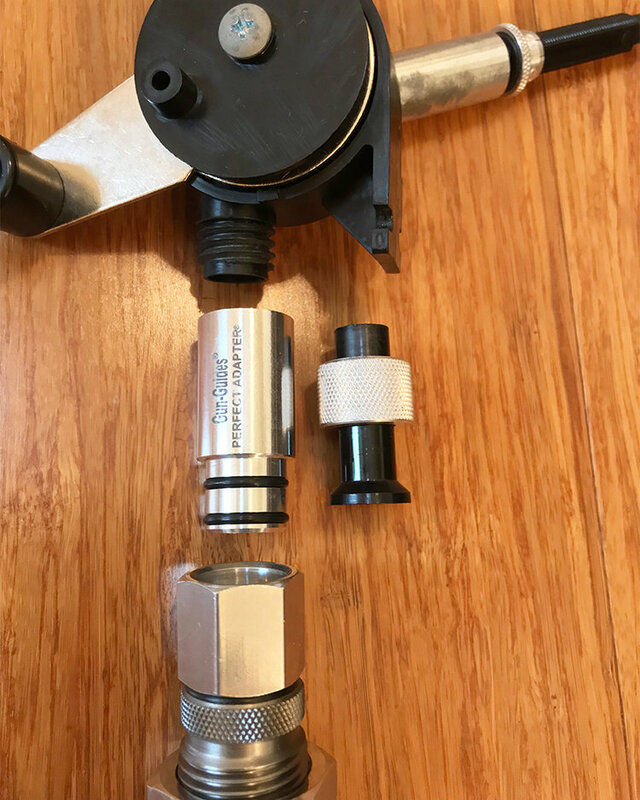 The bottom has two O-rings to secure the adapter inside the Lee Powder Through Expanding Die. O-rings also allow you to index the orientation of the charging handle. "This little adapter is worth it's weight in gold! " "If you use Lee dies, and you own a Perfect Powder Measure, this really is a must have." "Saves a lot of time and doesn't force me into buying a progressive press quite yet." "A very simple tool that lets you add the Lee powder dispenser to the top of your press, makes it so much easier to prime, bell and powder throw all at once."